Note that: All passwords, bookmarks and other personalized data including the your custom settings be lost after restoring the default settings of the browser. 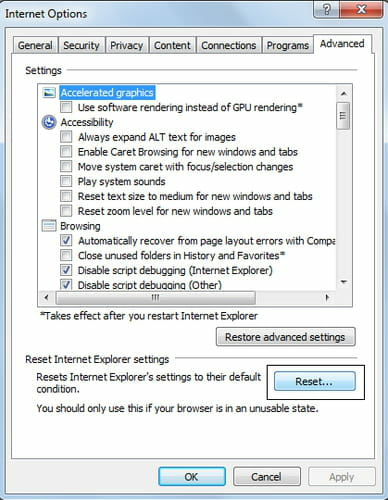 Your browser often crashes and you have tried all possible solutions to fix it? It may be required that you restore it to its default values. Note that all your saved items (passwords, favorites) will be cleared. Click on Tools > Internet Options. Go to the Advanced tab. Click on the Reset button. Close all running instances of Google Chrome. In the User Data folder, look for a file named as "Default" and rename it. Launch Google Chrome and a new "Default " file will be created. On the latest version of Google Chrome, click on the Customize and control Google Chrome button > Settings. Scroll down to the bottom of the page, until you reached the "Reset browser settings" section. Click on Reset browser settings. Click on the "Safari" in your Safari menu. A drop-down menu will appear, simply click on the Reset Safari tab. A warning dialog will appear pointing out what will be removed. Click on the Reset button to complete the process. Published by jak58. Latest update on October 15, 2014 at 11:27 AM by Jean-François Pillou. This document, titled "Reset your browser - Restore your browser to default settings," is available under the Creative Commons license. Any copy, reuse, or modification of the content should be sufficiently credited to CCM (https://ccm.net/).